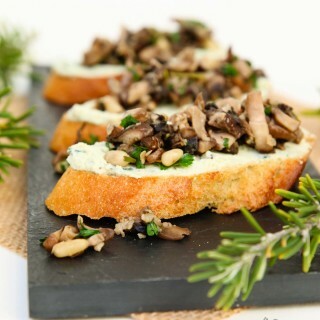 This party favorite uses a delicious tofu-based basil vegan ricotta spread, and is topped with a rich mixed mushroom mixture for the perfect bite-size appetizer! Heat a non-stick pan on medium heat. Add the olive oil. Add the minced garlic and fry for a few seconds until fragrant. Add all the finely diced mushrooms and saute on medium-high heat until all the water released from cooking the mushrooms burns off completely. Mix frequently. Add the salt, some freshly ground black pepper, and combine. Add the white cooking wine and mix to de-glaze the pan. Add the freshly chopped rosemary, parsley, and pine nuts. Combine and cook for an additional 1-2 minutes, mixing frequently. Season with additional salt and freshly ground black pepper to taste if needed. Turn off the heat and set the mushroom mixture aside. When you are ready to assemble, preheat the oven to 350 degrees. Place the thinly sliced french bread in the oven and bake until slightly golden on both sides. Remove the slices from the oven and allow them to cool on a cooling rack . On each slice of toasted bread, spread a generous layer of the Garlic Basil Vegan Ricotta Cheese Spread , and top with the prepared Mushroom Mixture (both should be at room temperature). Enjoy! Prep-Ahead Tip - You can prepare the mushroom mixture and the Garlic Basil Vegan Ricotta Cheese Spread ahead of time and store in the fridge until ready to serve. Gluten-Free Option - Use your favorite gluten-free bread or serve it on small lettuce cups.